BlueHost vs iPage: The Greatest Web Host? 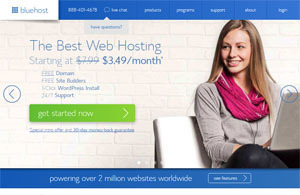 They are some of the most affordable web hosts on the market. At lower than $5 per month, you can just as easily build a website on Bluehost or iPage. Then… which one should you choose? Let’s compare them side-to-side from performance, support to price to find the greatest web hosting solution for you. A web hosting service created in 1996. Bluehost is known for their feature-rich, reliable and affordable hosting. Now managing over 3 millions domains, it’s one of the largest hosts in the world. In 2009, iPage relaunched its’ popular and affordable hosting service. Owned by big brand the Endurance International Group (the company behind BlueHost), iPage is now serving over 1 million users. 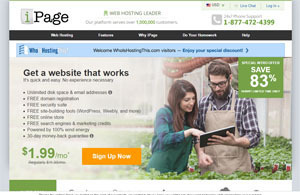 Within two short years after its’ re-launch in October 2009, iPage beats the odds to rank top on most hosting review sites. Of course, that’s not just because they are cheap. Without solid reliability and uptime you could set at a fantastic rate, but if people can’t actually get to your website because it’s down all the time or the servers are crashing, you’re going to be in a big pile of trouble. Jerry Low from Web Hosting Secret Revealed has been tracking two iPage-hosted sites for over two years. According to him, iPage’s uptime scored a stable 100% for the most part of 2015 and 2016. Another test from Coty over at Hosting Manual confirms iPage’s steady server performance. In short, you can trust iPage in terms of server reliability. 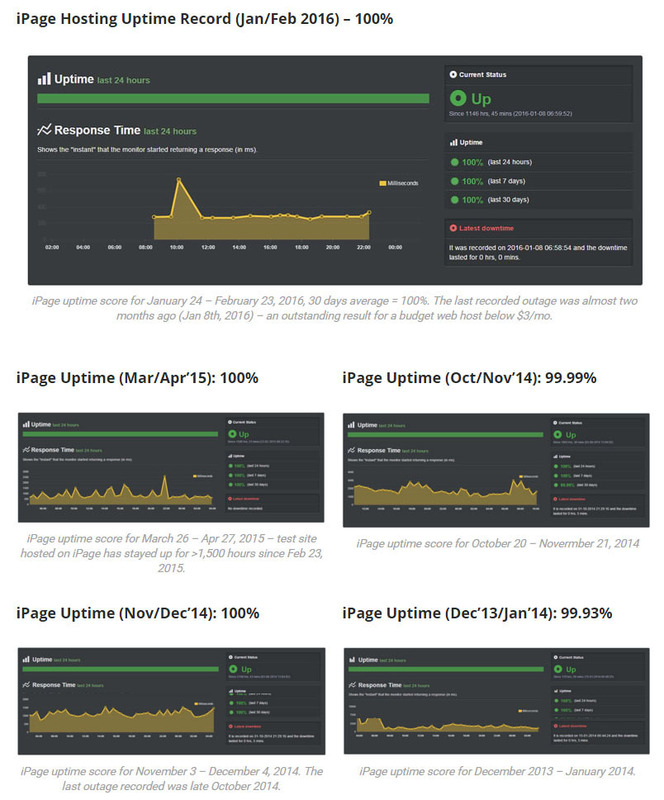 Uptimes are not everything when it comes to a site’s performance though. There is yet another crucial factor that may cost over 30% of your valuable visitors, site speed. While loading time depends vastly on site optimizations, your web host plays a big role as well. Since Web Hosting Secret Revealed reported their iPage site speed using Bitcatcha of only 72 and 27 milliseconds from United States servers, it’s safe to say that iPage users won’t have problems in this department. Although iPage boasts up to 800 Dell servers and has round-the-clock security, it doesn’t mean they never crash. This is not uncommon at all with any other web hosts. There may be hardware problems once in a blue moon, but overall iPage is a one of the cheapest hosts out there with such solid uptime history. Bluehost is not only recommended by WordPress, but many movers and shakers from Pat Flynn, Darren Rowse to Michael Hyatt. 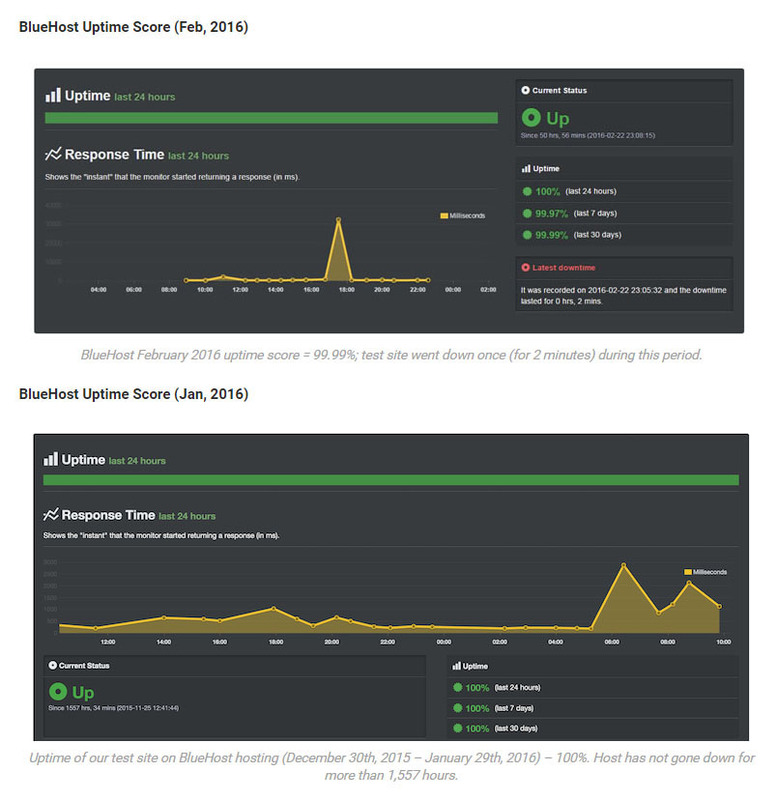 For one, BlueHost has some undeniably good server performance. In fact, one BlueHost test returns a 99.99% uptime from January to February 2016, with only a 2 minutes down time. Over at Host Benchmarker, Shane Labs shares a similar 99,926% uptime since July 2015. 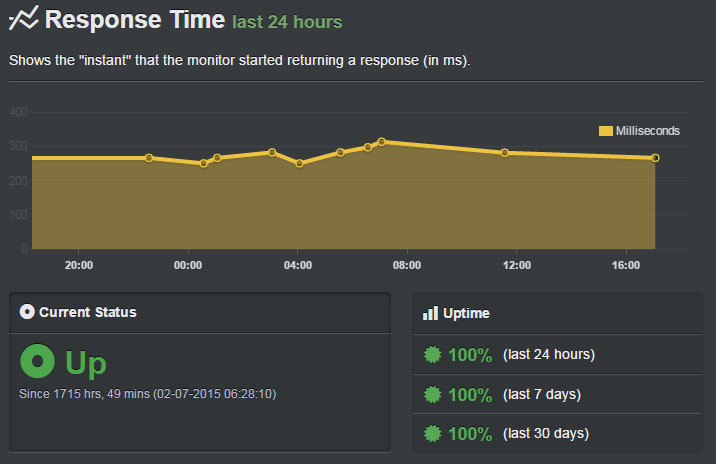 Bluehost performs alright in the Uptime test, with an average result of 99.93 percent. 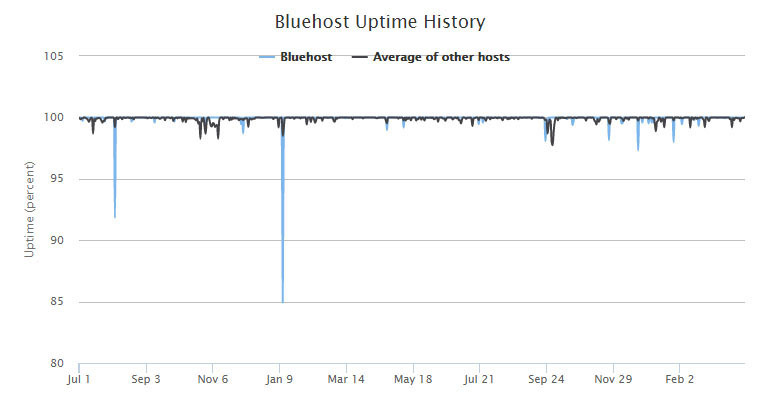 Bluehost had a terrible day back in August that’s bringing their average uptime way down. Other than that they’re usually pretty reliable. Living up to their name, BlueHost has a solid server performance that assures anyone can visit your site at all times. BlueHost doesn’t disapoint in terms of speed either, as Web Hosting Secret Revealed reported lightning response time at only 23 and 26 milliseconds from United States servers. Considering that BlueHost is one of the oldest and most renowned web hosting service, you can rest assured about their stability. That said, you’d want to know about Bluehost’s incidents in 2014 that caused two massive outages hitting some hosts owned by the Endurance International Group. Another thing you need to be aware of while using BlueHost’s shared hosting is CPU throttling, a feature introduced in 2009 that monitors your server resources and may possibly freeze your website in case you are pulling too much from their system. While BlueHost means good, claiming that this “makes sure that every user on a shared server gets their fair share of the system resources”, you are best to keep an eye on your CPU throttling log (located in the Statistics section of your cPanel) to avoid any undesired hassles. Technically, you can have a site up and running on iPage within minutes after sign up. But since all purchases are suspended to be reviewed by the order verification team, it’s not possible. In my experience, it took around 30 minutes to finally access iPage. The good news though, is that iPage’s cPanel is very easy to navigate. With features such as the one-click WordPress install (powered by the Mojo Marketplace) and site builder, iPage made sure to remove most of the techie hassles for starters. Like most web hosts, if you are new, it will take a while to learn a hang of things. Don’t be discouraged though, iPage offers a handful of guides and some videos to guide you through the process. With its’ simple interface and budget cost, iPage is easily the perfect starter package for anyone looking to build their first site. Unfortunately, iPage is not that good when it comes to support. I’ve never managed to contact them, even after waiting a whooping 14 minutes for live chat, I was still left looking at the loading screen for eternity. In this day and age you’d expect something more spontaneous. To be fair, there were others with different opinions. Dylan Harty shared he’d “contacted them more than 30 times and had a live chat more than 14 times. Each and every time, their support was friendly and quick”. Note though that he’s a VPS Hosting user, a more advanced hosting plan with a different support team. If you’re not satisfied with iPage, we’ll give you your money back. No questions asked. Some services may try to go around their refund process, but not iPage. Living up to their own words, iPage keeps the refund process very straightforward and hassle-free. Note that if you’ve register a free domain via iPage, there is a non-refundable $15 domain fee. Unlike iPage, BlueHost allows instant access right after your purchase. Also equipped with tools such as the one-click WordPress install (powered by the Mojo Marketplace), you can really have a site up and running in a couple of minutes at BlueHost. As a matter of fact, many guides even claim you can have a site up and running in 15 minutes or less. On the inside, BlueHost’s cPanel is very well designed (one of the best User Interface in my opinion) and full of extra features such as the 404 Settings, Image Manager, Index Manager and more. While these features can definitively be useful, for first timers it may be overwhelming to look at the sheer amount of options presented on the cPanel. To fix this, BlueHost boasts a very large knowledge base with step-by-step guides and video tutorials. Going over them for a few minutes and you’ll have no trouble setting up your host. In terms of customer support though, I honestly didn’t have great experiences with them. As an international user, I rely on their Live Chat and often have to wait for over 5 – 20 minutes at a time. This is a very long wait compared to other services such as NameCheap where you can access Live Chat almost instantly. Another thing I notice is that their support team is not very professional or engaged (it may take them over 1 minute to reply). There are some great staffs here are there but for the most part, I feel like it’s a little amateurish. It’s quite a let down coming from an established brand like BlueHost. Like iPage, BlueHost doesn’t try to force their customers to stay against their will. Even better, BlueHost users can ask for a refund at any point in time. Your satisfaction is our top priority and we’re confident you’ll be pleased with our services. Still, if you try us and decide your account does not sufficiently meet your needs, you can cancel at any time. Within the first 30 days, you may receive a full refund on your hosting service, afterwards you can ask for a pro-rated refund (for the remaining hosting months that you were billed). 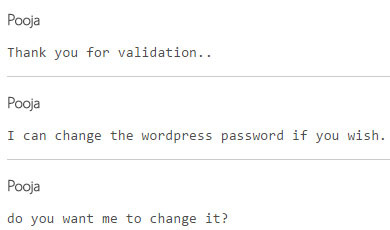 With such policy, BlueHost obviously made themselves vulnerable to their users and has to work very hard to keep them. Note that if you’ve registered a free domain via BlueHost, there is a non-refundable domain fee (that’s around $15). There is no doubt that iPage is one of the cheapest hosting out there. For shared hosting, you are offered the Essential plan with all fundamental features such as unlimited hosting, free domain name, webmail and 24×7 supports for only $1,99/ month. It’s important to note that while iPage always shows their monthly offers, you can only choose annual plans during purchase. This means you need to pay for at least a year in advance. This is actually a common tactic used by web hosts to attract customers including BlueHost, SiteGround, inMotion Hosting to name a few. In addition with some fundamental addons like Advanced Site Protection and Daily Backup iPage costs a minimum of $56.78 a year. You need to know however, that the $1,99 per month offer is only the initial, promotional price. You’ll have to pay a much higher price after your first billing period. iPage often offers promotions, coupons and special offers to customers during their initial term. Please note that special offers are limited-time promotional prices that are available to new customers and are valid for the Initial Term only, and not for successive or renewal periods. I haven’t seen this pointed out in most reviews but iPage’s renewal rates is actually more expensive than the majority of web hosts at $12.95 per month. In other words after your first year, iPage is not the best budget host anymore. It’s understandable though, iPage won’t be able to withstand their quality performance as a web host on such a low-budget. As the old saying goes “you get what you paid for”. 2. Or start with a more expensive web host that doesn’t pill up their renewal rate (like BlueHost). 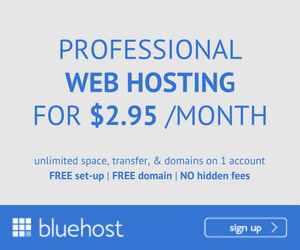 Bluehost’s shared hosting starts at only $3.49/mo. Having a very affordable price with huge space and bandwidth limits, Bluehost is an ideal offer for individuals, non-profits and small businesses. BlueHost has 3 available shared hosting plans, this allows you to start with the cheapest plan then scale according to your needs. Bluehost also provides all four level hosting plans – shared, VPS, dedicated, and reseller hosting. So you don’t have to worry about server upgrades or out-growing your host. However, there are a few things you need to know before choosing BlueHost. Like iPage, while BlueHost always shows their monthly offers, you don’t have the option to pay monthly. You need to at lease purchase a 12 months plan to start using the service. In addition with some fundamental addons like Domain Privacy, Site Backup and SiteLock, BlueHost costs a minimum of $119.04 a year. That’s almost double the initial price at iPage. The good news is that, to make up for their more pricey sign up cost, BlueHost’s renewal rates is only at $8.49 per month (for the Basic plan) which is reasonable compared to other web hosts. If you are looking for a long-term web host, BlueHost is a decent choice. While BlueHost and iPage are both quality web hosts with stable server performances, their business models differs so significantly that their target audience are unlikely the same. In other words, it’s not about finding the better host. The question is which one is right for you? If you want a non-attachment website to test run a new project for example, then iPage is perfect for you. It allows you to create a fully functional site with some of the cheapest hosting price on the internet. While their renewal rates are pretty high, you can always transfer to another web host later to avoid it. If you are looking to build an online presence (especially using WordPress) with a trustworthy and world-famous host then you’d want to go with BlueHost. Being one of the largest web hosting service, BlueHost is a reliable solution with reasonable prices, both before and after discount. I hope this post helped you pick the best web host according to your needs. Feel free to drop a comment if you have any questions about BlueHost or iPage, I’ll try my best to answer! Nice article. As per my experience Bluehost and hostgator are reliable hosting services. They both have great support system. Thanks Arati, for sharing! While I don’t have much experiences with Hostgator but I can certainly vouch for BlueHost! Thanks a lot for the great comparison. I was confused between iPage and Bluehost. As I am hosting a WordPress website, I will now go with Bluehost. Prasad, I know how web hosting can be confusing when you start. I’m glad you found the better host for you. Feel free to let me know if you have any questions on BlueHost etc. it’s always my pleasure to help! Thanks for keep me learnt new things via sharing! KarthikLinga, I’m glad you learned something new about hosting services. It never hurts to learn more. 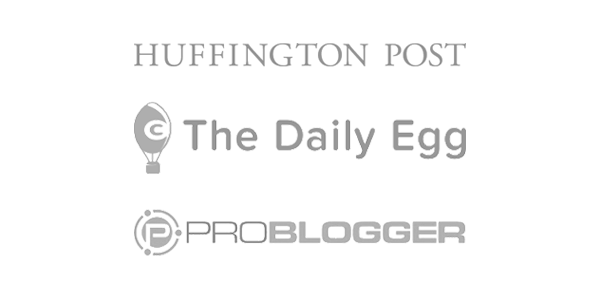 🙂 If you are interested in setting up a blog, you’d want to check this post out. Great review you explained very well the differences between the two and left me with almost no questions. That brings me to my only question. Have you used either of these services? Or know someone who does? Also you mentioned Wealthy Affiliate can you tell me how that compares to these two? This is a nice article you have here. I have never even heard of iPage before. I have heard of BlueHost but after reading your article looks like iPage might be more of what I would use. However, I am using Wealthy Affiliate as my web hosting for my websites and haven’t had any issues as of yet. You have a lot of detail in this article which is a must. Thank you so much for sharing. I’m glad you found the article helpful, Tanya. I agree that Wealthy Affiliate is a pretty good host overall. What a great review! You are saving me time to look for further information as I’ve got everything I need it. I wasn’t sure about BlueHost but after I read your post I make up my mind. I read some of the comments that people are using Wealthy Affiliate’s hosting? What is that? Thank you! 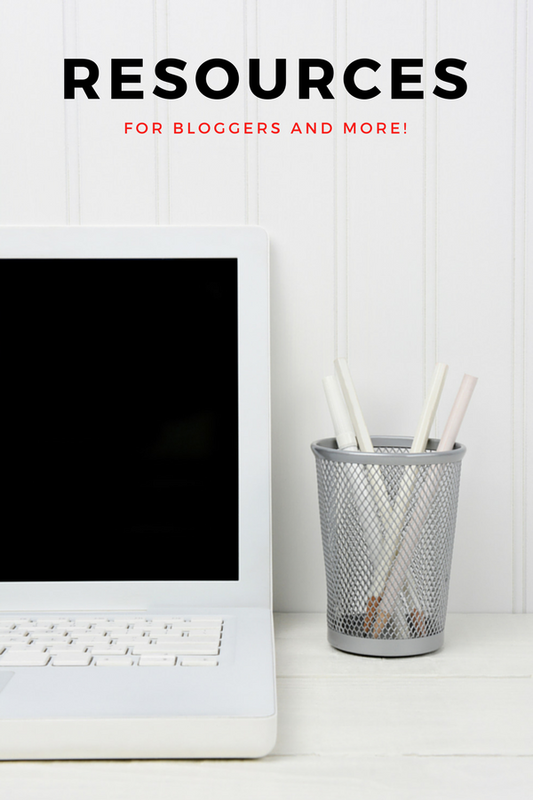 I previously learn’t all about BlueHost from another blog, I am currently using the free hosting that Wealthy Affiliate offer. My question to you is, should I bother with BlueHost? Is there any need if my website is relatively new and not getting huge amounts of traffic? Thank you for this review. I’m actually quite new in webhosting. I only had experienced with Wix and recently created some blogs under Wealthy Affiliate. My concern has always been the uptime and the security of our pages. And definitely if we are hosting it for long term, cost could be a major concern. I think BlueHost could be a good fit for me, as I’m more into blogging now. Bluehost is probably one of the most popular web hosting services, eh? iPage, though, I haven’t really heard of them. I’ve read a lot of complaints on Bluehost. Which is why I’ve never used their services. I like SiteGround. I’ve got a blog with them and I haven’t experienced anything bad. Wealthy Affiliate’s hosting is pretty awesome, too. I have a couple sites with them and have had nothing bad happen. Julian, Bluehost sure has a strong presence in the web hosting world. As for the complains, they are mostly about their customer support and to a point, I agree that it can be very frustrating especially when you need help. Other than that, I trust BlueHost for being recommended by WordPress and influencers Pat Flynn. My experience with them is pretty good as well, except for the customer support part. Reading your article for quite some time. It’s very detailed and informative. I would definitely choose BlueHost as they look very professional and their stats look good. The promotional offer from iPage looks very good but what they charge for renewal is a bit expensive. I think even for a beginner website, BlueHost should be the first choice. Anyway, nice comparison. Thanks for making this all so much clearer now. I was beating myself up about which web host to go with for a while now and you have helped me make my decision. I love Bluehost because it is easy and affordable but sometimes I want to run a test site in a particular niche before I go all in and for that I can use IPage. Shane, I’m glad I can help! Feel free to ask if you have any questions. From your reviews, both Bluehost and iPage sound awesome! The question is, which one should I choose for my own website? 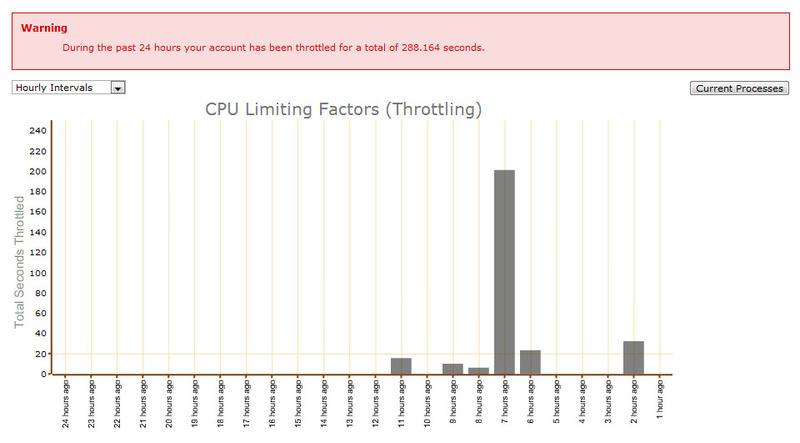 However, the CPU throttling with Bluehost is a concern for me. But having said that, there are cons with both hosting platforms. I think I might just have to read your review a 2nd time to come to a concrete decision on whether to choose Bluehost or iPage. Thanks very much for the breakdowns of both. Neil, thanks so much for the kind words! As for BlueHost’s CPU throttling, while there are very few complaints nowadays, it’s surely something you want to look into. I have not used both of the above hostings. But you have done a very good comparison, which has helped me to learn many new things. Aww, thanks Robin! I hope this helps you learn something new about web hosts. What a joy to read yet another comparison post! Wonderful review indeed. Good to read about these two hosting companies pros and cons. Well presented with lot of screenshots cPanel display and other connected links. Hey, I am using BlueHost. and their response form the support team also is good comparing with some other sites. Thanks for sharing these review. I am sure this will surely be a guide to the newbies who opt for a better host. Great to hear from you as well! It’s great to hear you are using BlueHost, I always think it’s the independent host I’d use for my main blog if I wasn’t already on Wealthy Affiliate. 🙂 Maybe I was expecting more from BlueHost’s support team, but if you are patient with the wait (and do something else in the mean time), it’s not that bad. The rates shown per year – is that for one website or is it possible to host more than one site for that price on either BlueHost or iPage. I was interested because you go onto mention Wealthy Affiliate at $49 per month but that includes hosting for up to 25 domain sites? Endurance International Group own a lot of top hosts in the industry including BlueHost, iPage, HostGator, HostGator.